Janet Yellen’s remarks last Wednesday brought rising interest rates back into focus. 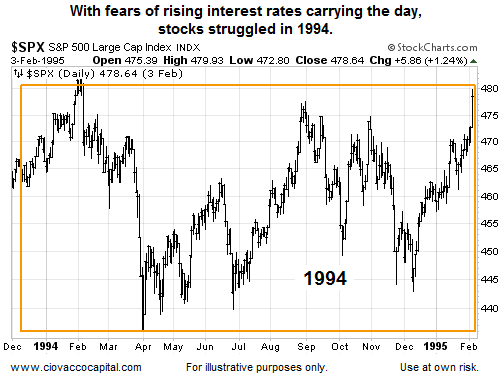 If the bond market reacts and interest rates spike as they did in 1994, it could spell trouble for both stock and bond investors. 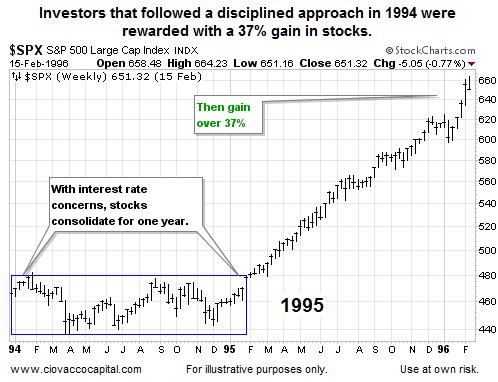 If 2014 proves to be more challenging than 2013, the sharp gains in stocks that occurred in 1995 highlight the importance of sticking to a disciplined risk management approach. The recent spike in rates conjured up fears of a bursting bubble in bonds, a rapid and disruptive increase in interest rates that would produce big losses for individuals and institutions with big bond portfolios and raise borrowing costs across the economy. There were more than a few references this week to 1994, when Alan Greenspan’s Fed raised short-term rates after a long hiatus, bond markets around the world tanked and Orange County, Calif., ended up in bankruptcy court. Since a picture is worth a thousand words, the chart below shows what a very sharp spike in interest rates looks like. The next chart shows what a very significant spike in interest rates can do to your stock portfolio. 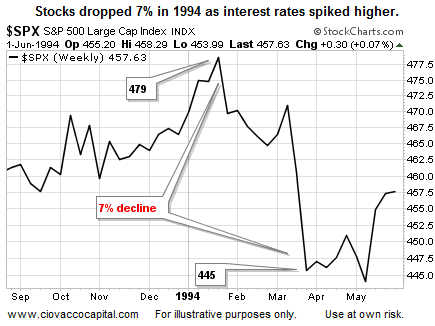 The S&P 500 dropped 7% during the first quarter of 1994. Could Stocks Struggle In 2014? If rising interest rates become the dominant theme, it is possible 2014 traces out a consolidation look similar to the one shown below. If 2014 turns out to be a sideways year for stocks, it is important to understand what that means. Markets that trade within a range, or consolidate, are a reflection of a fairly even battle between economic bulls and economic bears. Sideways markets are difficult and frustrating for stock investors; that is the bad news. The good news is the longer the period of uncertainty lasts, the higher the probability that a big move will follow (see below). If you have a systematic approach to the markets, as we do with our market model, the importance of sticking to your discipline during frustrating periods cannot be overstated. As outlined on March 20, the present day market has a “flat momentum” profile, which can lead to frustrating and sharp volatility in stocks. After a correction-less 2013, many investors have forgotten that corrections and consolidation tend to be an annual rule, rather than an exception to the rule. 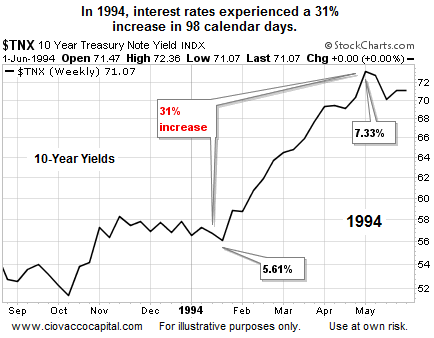 The spike in interest rates in 1994 highlights the importance of: (a) being mentally prepared for a more challenging environment in 2014, and (b) the importance of staying within the confines of your approach to the markets. The evidence we have in hand continues to favor stocks over bonds. Until the evidence shifts, we will continue to maintain core positions in U.S. stocks (SPY) and technology stocks (QQQ). For the record, during the first four trading days of the week SPY beat bonds (TLT) by 3.05%, and gold (GLD) by 5.84%, meaning stocks have been the place to be. Stock market bears still have Friday to make some noise. We will continue to observe the evidence with an open and flexible mind. Chris Ciovacco began his investment career with Morgan Stanley in Atlanta in 1994. With a focus on global macro investing, Chris uses both fundamental and technical analysis to assist in managing risk while looking for growth opportunities around the world in all asset classes. He is now the Chief Investment Officer at Ciovacco Capital Management. Chris has been managing money and serving investors for over 14 years. His research and writings have recently been recognized by the allocation of a chapter to his work in the soon to be released book, Management of Hyperinflation and Deflation. Mr. Ciovacco has been quoted in several media outlets, including the Dow Jones Wire Service, MarketWatch, and Nasdaq.com.